Some of you may have heard about the recent launch of Google Latitude, a fun new way to share your live location with friends. For those of you who aren't familiar, Google Latitude is a feature of Google Maps for Mobile that lets you (if you choose to opt-in) share your whereabouts and receive updates about your friends' approximate locations. While we've already launched an iGoogle gadget, we knew that our launch couldn't be complete without bringing this to orkut. That's why a group of us on the Google Mobile team have created a Google Latitude application. 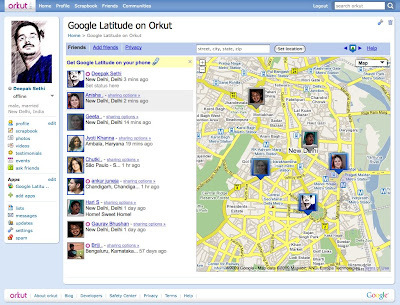 With this app, you can share your location and see your friends' locations on a map inside of orkut. Notice that an old friend is back in your hometown? Just click on her photo and send a scrap or head to her profile page and see what she's up to. If you use Google Latitude from your mobile phone, you can even send your friends updates on your location while you're out and about, making it easier to bump into the people you care about. Of course, none of this would be very much fun at all if you didn't have control over what and when you share and who you share it with. We've taken Latitude's privacy features very seriously and invite you to learn more about them in either the Help Center or by watching this privacy video. Excited? Add the app and let your friends know where you are!